1997/98: Scholarship from the Foundation for German-French Cultural Co-operation,stays in Paris, Poland and USA. 2000: Video-Installation-Prize Marl, installation concept of Windportraits shown at the exhibition. 2006: First Prize, "Video Art Prize octobre rouge", Luxembourg. 2001-2007: Co-initiator of the international media art projects "Gegenort- The-Virtual-Mine" and "Virtual Residency"
2012: Fellowship der Kulturstiftung Rhein-Neckar-Kreis e.V. 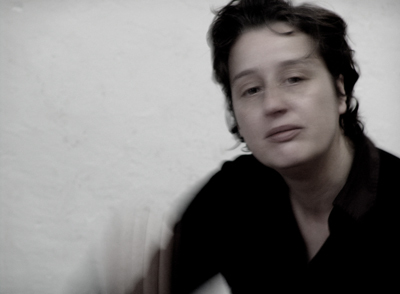 In 2002-11 Claudia Brieske was working as a lecturer and artistic scientific associate for „Intervention Projects in Public Spaces“ at the University of Fine Arts Saar. In the years 2014-16 she was a lecturer at the Haute Ecole pédagogique Friborg (CH) for video/performance and since 2016 she has been curating art projects for students at the WK Berlin. As an artist, she realizes site-specific video and sound installations. The relationship between sound, image and movement has a special meaning in her work. Her approach: so-called „metaphorical Gestures“, i.e. sequences in which simple gesture is focused so that complex perception levels are revealed and new forms of communication explored. Engagement in diverse activities in festivals for New Music and collaborations with dance and theater productions allowed her to develop her work in various directions. She holds the European Diploma in Cultural Project Management from the Fondation Marcel Hicter in Brussels. She is a founding member of the vocal ensemble VOXLabYrinth Bern (CH) and the Initiative temporäre Kunsträume (Initiative for Temporary Art-Spaces) in Berlin. January 2009, she has participated in the BFH research project, Gesture Performance. audiovisual media art project, Station I: Feste Dilsberg, Station II: Saarländische Galerie - Europäisches Kunstforum e.V. 2011: Liquid Souls, video- and sound installation for "Musiktage Donaueschingen"